This photo of a fallen bronco rider at the 2015 Cloverdale Rodeo & Fair is one of two winning photos by Surrey-North Delta Leader's Boaz Joseph in the Local Media Association's Excellence in Local News Coverage contest. Below is a Leader front page that was also recognized. North America-wide association lauds local news coverage. The Surrey-North Delta Leader has received four more awards – this time from an organization representing 2,600 newspapers across North America – for its journalistic excellence. The Local Media Association announced the winners of its 2015 Excellence in Local News Coverage contest winners March 8. Sheila Reynolds won first place in the Best Coverage of Local Education/School District Issues category, based on numerous stories she wrote about topics concerning the Surrey School District throughout the year. 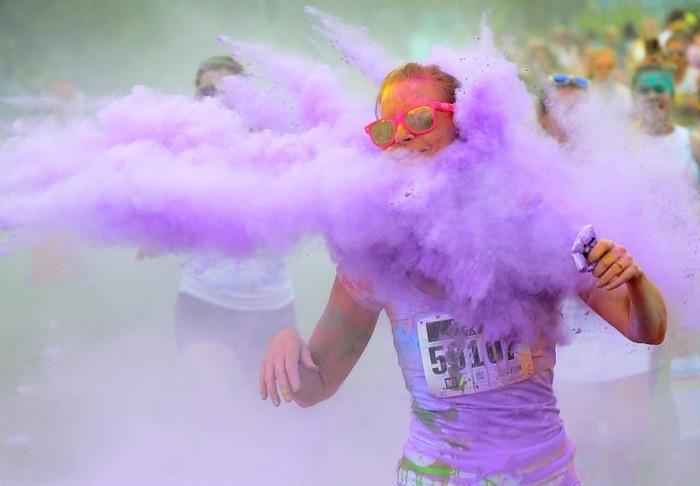 Boaz Joseph took first place for Feature Photo for a photo he took of a purple paint powder-covered competitor at the Color Me Rad run Surrey last year. Honourable Mention also went to Joseph in the Sports Photo category for his dramatic picture of a fallen bronco rider at the Cloverdale Rodeo & Country Fair. 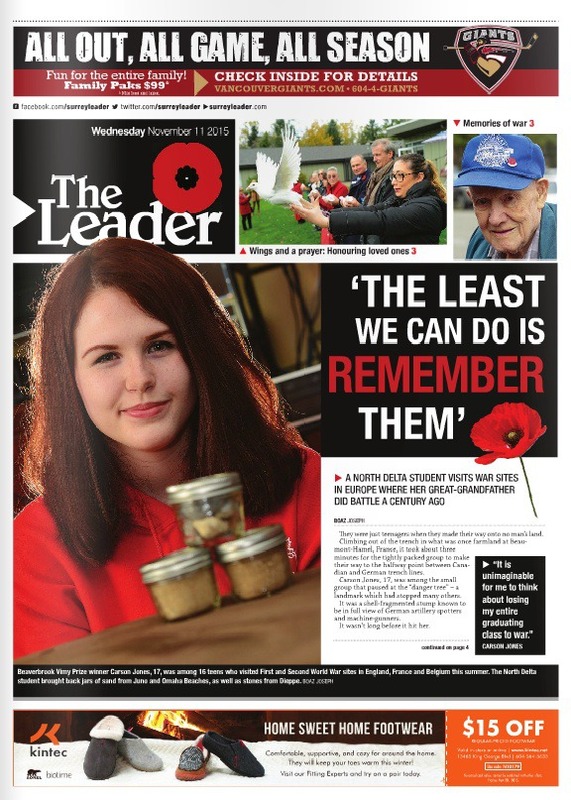 The Leader’s Remembrance Day issue – which featured a North Delta student’s story of traveling to European war sites where her great-grandfather fought – received an Honourable Mention for Best Front Page. Last week, Leader journalists were also named finalists in three categories at the B.C.-wide Ma Murray competition. The winners of those will be announced in May.